Is your Outlook running slow? Are your backups growing and growing with no end in sight? If this is the case, thing you may want to do is see if you have some large email attachments you have already saved to your computer. How can I find those large emails and delete them easily? Outlook has tools built in to help you do this. 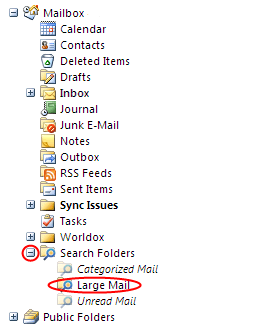 You'll need to open Outlook and expand the Search Folders option, then click on Large Mail. After you click on Large Mail, you'll have four mail sizes that you will want to sort through – Enormous, Huge, Very Large and Large. If you have a large number of Enormous e-mails, we suggest that you go through and look at the attachments. Do you already have the files stored somewhere? If so, delete Enormous emails that you already have stored. If not, save the attachment and then delete the old e-mail. In general, you want to try to have less than 5000 emails in your Inbox folder (as recommended by Microsoft) because when you start Outlook, it has to load the Inbox folder. You can move emails to other folders to help cut down on load times for Outlook, or you can delete old items in your inbox. Another idea is to create folders for years, and move every email from 2009 into the 2009 folder, 2008 to the 2008 folder, etc. Other good places to free up space are your Deleted Items folder and Junk E-Mail folder. You can empty those folders by right-clicking on them and then selecting Empty "Deleted Items" Folder or Empty "Junk E-Mail" Folder. That can also clean up a large amount of space. We do not recommend Archiving or AutoArchiving your emails, because when you do this it moves your email into a different file, which you then have to manage, and those files have a 2gb limit which means that eventually you'll have the same problem all over again. Hopefully this will help you to clean up your inbox, reduce the size of your backups, and speed up your daily Outlook usage. Post comments or email us if you have questions.